Dental implants are an excellent choice when it comes to replacing missing teeth. A dental implant is an artificial tooth root made of titanium. It is placed in the jawbone and used to support a dental crown, dental bridge or a denture. Implants provide a long-lasting, durable solution for missing teeth. In fact, if properly cared for, implants can last a lifetime. They look, feel, and function just like your natural teeth. Whether you need one or more dental implants, Dr. Padolsky will perform the procedure for you right in his office. 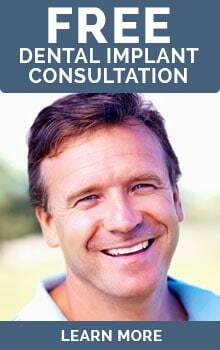 He has over 25 years of experience successfully placing implants in over a thousand patients. Dr. Padolsky will take the time to listen to your concerns, answer any questions you may have and explain the entire procedure to you. Dr. Padolsky stands behind his work. His many years of advanced training and experience in placing dental implants will give you the confidence and assurance that you are in good, capable hands. Dr. Padolsky earned a Fellowship in the International Congress of Oral Implantologists. Additionally, he completed the first university-based dental implant course (AAID Maxicourse) offered in the U.S., and he completed it twice! Only three other dentists in the U.S. have done this. Dr. Padolsky uses the latest advanced procedures and leading-edge technology to carefully plan and perform your dental implant placement. To make an appointment, call 404-476-5504 or click here to request an appointment online. A CT scan is done to get a detailed 3D view of your jaw for planning your surgery. Your dental implant treatment starts well before the day of your implant surgery. In fact, we do most of the work ahead of time. 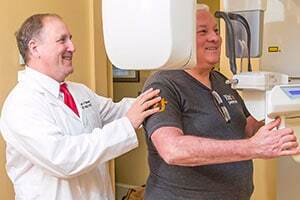 Dr. Padolsky uses the 3D X-rays to see how much available bone you have, the state of your gum tissue and to map where the nerves, sinus cavity and other oral structures are. Using 3D software, he can then assess if you will need bone grafting to provide enough bone to place an implant and we can plan the exact position angle in which to place the implant. 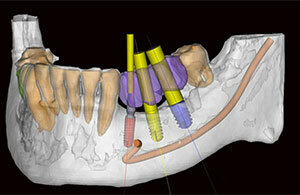 3D implant planning software is used to plan your procedure in detail ahead of time. Once we have virtually mapped where we will be placing the dental implants, we get a surgical guide fabricated that is placed over the gums to guide the implant into the exact right position. We make sure you are fully comfortable during the implant procedure. Dr. Padolsky uses a slow injection technique for numbing the area to be worked on and provides enough anesthesia to keep you comfortable throughout the procedure. Depending on the procedure you are getting, a tooth or multiple teeth may need to be extracted. Dr. Padolsky uses a technique which preserves bone structure and causes less trauma to the gum tissue. In many cases, patients do not feel the need to take pain medication after the extraction has been done. If there is not enough bone to support a dental implant, Dr. Padolsky will perform a bone graft prior to placing the implant. This may be done at the time of any extractions. A sinus lift, or sinus augmentation procedure uses extra bone to build-up or support the sinus wall needed to support a dental implant. It is needed when the floor or wall of the sinus is too close to an area where dental implants are to be placed. After your surgery is completed Dr. Padolsky places temporary teeth until your dental implants heal, usually four to six months. Your permanent teeth (crowns, bridge or dentures) are fabricated from high-quality durable and aesthetic materials. Dr. Padolsky uses his training and experience to make sure your new teeth are attractive and complement your face and personality. He also pays just as close attention to the function of your new teeth and makes sure your bite alignment is correct. This is the key to ensuring your dental implants last. “My implant process was complex, as I did not have any lower teeth. The purpose of the implants was so the dentures could sit on top firmly. 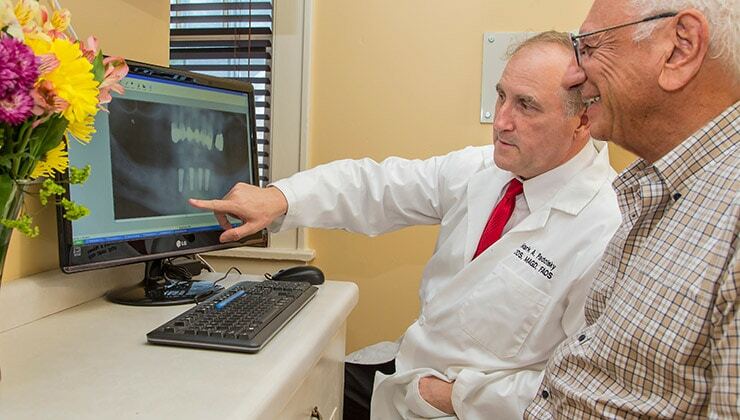 Although the process was long and laborious, Dr. Padolsky was patient and methodical and he made it as easy as possible. “I have been using the services of The Atlanta Dental Group for over 10-years, having done an upper partial in addition to lower implants. I am impressed with Dr. Padolsky’s skills as a dentist; he is a combination of a doctor and an artist.